We would like to thank all visitors of the State of the Map 2009 in Amsterdam for joining us for 3 wonderful days. We are convinced that it has been a huge inspiration for all interested in maps. We hope to see you back soon some other time at a SOTM conference, mapping party or an other OSM gathering. Find the #SOTM09 GigaPan Photo here. Come back to this website for more news, announcements, video, presentations, etc. We’re been recording most, if not all, SOTM09 talks and we intend to publish as many asa possible. Processing all these hours of video takes some time though, and we need to prioritize! Which talks would you like to see (again) first? Nominate your favorites on the OpenStreetMap wiki! People from all around world could follow the presentations live on the Internet, via Twitter (#sotm09), Flickr or in some Dutch newspapers. Get ready for some more State of the Map action tomorrow in the State Room, Map Room and Workshop Rooms. The doors of the conference centre will open around 8.30 am. Expect a full conference centre because we are completely sold out! 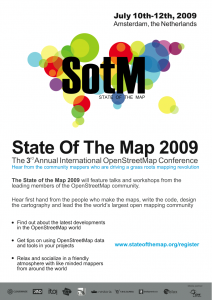 State of the Map 2009 has started, and we’re streaming the event to your desktop – or at least we’re doing the best we can given the technical constraints we’re working with. Enjoy! For this year’s edition of State of the Map we had a talk with Maarten Oldenhof, Chief Executive Officer of AND Automotive Navigation Data. AND is the only independent mapmaker, has contributed to OpenStreetMap since 2007 and is sponsor of the conference. Why have you contributed to OpenStreetMap? As a mapmaker we always want to be at the forefront of new developments. You can wait and see what is happening around you, but that is not what AND is about. We want to be involved with new trends in the world op maps and location and we regard OpenStreetMap as an interesting development that aligns with the views we have on the future, where location based services will be hot. Can you explain more about your partnership with OpenStreetMap. How are you leveraging the relationship to support AND’s long-term objectives for revenue growth? AND Automotive Navigation Data has donated digital maps of the Netherlands, India and China to OpenStreetMap in 2007. The Dutch OSM community has added a lot of detail to this map, such as pedestrian areas, cycle paths, POIs, etc. With the donation AND recognized the power of a community, User Generated Content and the Web 2.0 developments. We call this Map 2.0, another example of this is AND Map 2.0 (www.map20.org). Don’t you see OpenStreetMap as a threat to you business model? Not at all. We regard it as an important development that adds to our view that knowledge about your whereabouts and all the relevant things in your area is a key trend. That’s why we are enjoying the cooperation with OpenStreetMap and are looking forward to share views with the other participants. A lot has been said about user generated maps and, a potential shake up of map provision and licenses. What’s your take on the situation, especially in light of OpenStreetMap coming to the fore? AND Automotive Navigation Data is the only independent mapmaker left over in the market after the takeover of TeleAtlas by TomTom and Navteq by Nokia. AND has profited from these developments by signing a contract with a big US company. With this contract AND proves to be an alternative to the other players in the market for maps for Western Europe. AND believes in the power of a community and the Web 2.0 developments. In the long run we believe there will be room for all, like Linux next to Windows and Microsoft Office next to Open Office. How is AND doing this year, in the wake of the global recession? We are experiencing a great year. In April we announced a large contract with a big American online company for the delivery of digital maps for Western Europe. As a result, AND expects sales to triple and profit to increase five-fold in 2009, compared to 2008. Apart from this contract there are more opportunities for further organic growth, not only by the continuing strong growth of Smartphones, but also by the efforts of other players in the online market who try to capture a position on the mobile internet through location-based services. In the future, almost every mobile electronic device will be fitted with GPS capability, giving huge growth in the use of maps. How will AND compete with new “live maps” that can be created by companies offering user generated traffic reports such as Waze and Dash Navigation (now owned by RIM)? For a navigation map you need many navigation attributes. The “live maps” cannot generate all these attributes. In the AND Labs we always look at how we can showcase and produce our maps. We are also looking at automated mapping generation based on GPS tracks, pictures, etc. If you’re attending State Of The Map, chances are that you’ll be in Amsterdam by Thursday night. What better way start off your SOTM weekend than to join fellow attendees for some pre-conference drinks? We picked a great place for that: the bustling Nieuwmarkt square (map) in the heart of the old city. If you want to have dinner nearby beforehand, there’s a lot of options. De Waag itself is OK but quite pricey. Excellent and cheap Chinese and Thai food is to be had on Zeedijk, just off the square. Nieuwmarkt itself is home to ‘café Bern’ – arguably the best Swiss cheese fondue outside of Switzerland, as well as ‘Plein 26’, the place to go for Dutch fast food. 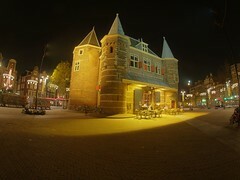 Several of the other bars on Nieuwmarkt serve food as well. See you Thursday from 8pm on! 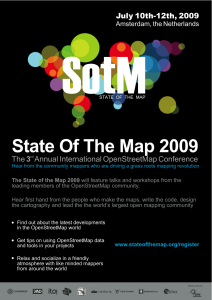 We are only a few days away from the start of the State of the Map 2009. This is the first year that we have held a day dedicated to the professional uses of OpenStreetMap – the Pro Users’ Day. On Friday 10 July you will learn how your business, governmental or non-governmental organization can benefit from OpenStreetMap’s rich dataset. schedule for the Pro Users’ Day. There will also be plenty of time for networking with representatives from companies such as AND, Bliin, Carmenta, CloudMade, the European Commission, Falk, Fugro, Gemeente Amsterdam, Geodan, Geofabrik, Geotate, LogiBall, Navteq, Nutiteq, Planbureau voor de Leefomgeving, PTV, Skobbler, TomTom, Yahoo and many others. There are only a few days left to register and even fewer tickets left. Click here to register. Tweeting about State Of The Map, before or during the conference? Use the #sotm09 hashtag. Have something to say in your own language? Use your language code as an extension! Let’s assume I want to share some SOTM09 buzz with my fellow Dutch speakers – of which there are well over 20 million, I might add – I will use #sotm09nl. My German friends would use #sotm09de. Help spread the word even better, tweet in your own language – what are you looking forward to in particular, what are you going to say at SOTM09, why do you think SOTM09 is going to be great,when are you going, where are you staying, ride sharing, do tweet! From 35 nominations, in 19 countries, we had the difficult task of choosing 15 recipients. Barring any unexpected problems (and sorting out the arrangements in short time has been no easy task either), we will have the honor of welcoming the following mappers to Amsterdam. Many thanks go to the Open Society Institute for helping to make this happen. State Of The Map posters are now available for download! Use them to promote State Of The Map – in your workplace, school, university, or anyplace you see fit. You can download both black and white versions, in A3 and A5 paper sizes through the links below. The posters are provided as high resolution PDF files. We’re looking forward to seeing them appear around the globe!